What you need to know about flowers? Orchids can be called the conqueror of women's hearts! How many female representatives arrange a whole orchid flower garden on their balcony, carefully look after them and regularly replenish their collection. Representatives of the family of orchids spread throughout the globe: rainy tropical forests, savannahs, steppe, cold mountain areas - become a cozy home for their life. A huge variety of species of the family of this flower can be found in the tropical and subtropical zones of East Asia, South and Central America. These regions are home to the bulk of the orchids, which are bred to us as domestic plants. Orchids were a subject of admiration in the days of Ancient China. In the XIX century orchids appeared in England. But they were used as a packaging material for tropical plants. And perhaps, they were misused even further, if one day the gardener William Kathleigh did not plant this plant in a pot. Through time, the plant blossomed with extraordinary beauty with flowers. In honor of this gardener, the genus of the orchid, to which the flower he grew, Cattleya, was named. What is the charm of an orchid? Female heart orchids conquer with their magnificent, tender and quivering flowers, which create a certain freshness and airiness. In this flower there is a certain amount of refinement and elegance, charm. But despite its beauty, this flower is completely uninvolved. Perhaps, for this reason, this flower is also a favorite among the female half of the population. Now more often in stores you can find blue, black orchids. But despite the huge number of species of this flower, blue and black shades in nature does not exist. They are simply painted with special dyes, which in time fade and become completely different colors, sometimes not quite beautiful. 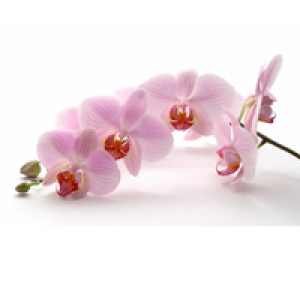 Therefore, choosing an orchid for a gift, such original and bright shades of colors later have certain drawbacks. Consider this, so that in the end you will not get an unpleasant surprise. How to choose the right orchid? Despite the lack of rigidity in care, it is important to know how to choose the right orchid in the store. Quite often it happens that at first the flower pleases you with its charm, but after a few weeks begins to wither. The reason for this can serve as the following: wrong transportation of flowers, sudden temperature changes, dietary supplements serving for rapid growth, powerful phytolamps, from which the plant grows really fast enough, but also quickly afterwards starts to ache and wither. The main rule for such producers is to sell the blooming orchid as soon as possible and to absolve oneself of the responsibility for the quick death of the flower. It does not sound very rosy, but do not despair. It is important to simply know how to choose the right orchid, which will please you with its freshness and unusually trembling flowers for a long time. 1. Inspect the orchid carefully. The flower should be fresh. The leaves should be green without stains and any damage. Just look at the back of the leaf, it should not be sticky and stained. If a sticky spot is found, it means that bacteria live on it. The exception is Cattleya's orchid, the stickiness on her leaflets is the norm. 2. Check if the plant is well planted. 3. Pay attention to the flowers and buds. If you notice any stains, it is better not to take such a plant. 4. Inspect the roots of the orchid. It is considered normal if the roots are silvery or gray or bright green (which means they were recently watered). On the roots there should be no formations, white deposits or signs of decay. Follow the rules, and then the orchid will truly be an amazingly gentle decoration of your house.